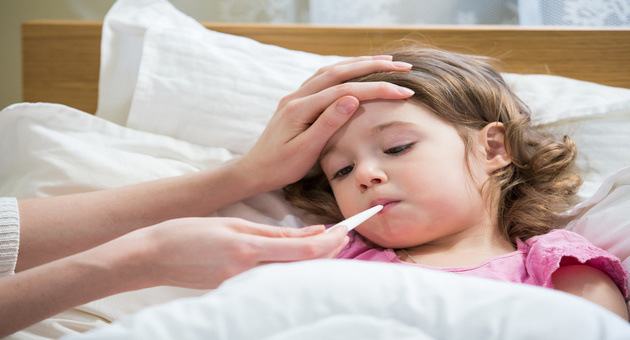 Home » Health A-Z » What Should You Do If Your Child Gets A Fever? What Should You Do If Your Child Gets A Fever? Episodes of high temperature are common in children during their early years due to their developing immunity. However, parents need to understand that most fevers are usually not life-threatening and are nothing but the body’s defence mechanisms in response to any kind of infections. How Much Temperature Is Considered To Be Normal In Children? The normal body temperature is about 98.6 °F. Temperatures above 100.4 °F signal fever. Most fevers are viral and are not serious in nature. -Common signs of fever include warm skin, sweating, fussy and irritable child, flushed skin and loss of appetite. It may be accompanied by vomiting, sore throat, loose stools, runny nose, and cough. What Should You Do In Case Your Child Has Fever? 1 . Administer plenty of fluids to the child to prevent dehydration. As the body develops a high temperature, it loses water. 2 . Administer paracetamol as per your child’s weight as directed by your physician. 3 . DO NOT use aspirin. 4 . Do not put extra clothing or cover up your child. Use light clothing on your child and let the body cool. 5 . Do not force feed your child. An adequate amount of fluids (2-3lts) is enough to keep the child hydrated and maintain urine output. 6 . To bring the temperature down quickly, do fomentation using a cool, wet cloth on the forehead. 7 . You may also keep the child under a fan to help in bringing down the temperature. 8 . You can give your child a bath with lukewarm water to lower his/her body temperature. 9 . If a child who is 3 months or younger has a temperature higher than 100.4 °F (38°C), seek medical care immediately. Avoid sending your child to school or daycare until the child’s temperature is normal at least for a duration of 24 hours. Ensure, that the child gets enough rest and sleep. While preventing a fever is difficult, following these simple tips, you can ensure your child’s health doesn’t deteriorate till medical help is available. Can PCOS Affect Your Pregnancy? How To Cope With Acidity and Acid Reflux? ← Read Books To And With Your Child, Science Too Suggests This!